Pantheon of Chaos Part 2 Kickstarter is now up! These miniatures capture the essence of fantasy gaming that got me hooked at the tender age of 11, and i’m having a blast taking a trip down memory lane with this line. Seriously, do yourselves a favor and check them out, you won’t be disappointed! Once I have 5 minutes to sit down with a paintbrush I’ll be doing a review of the miniatures I have so far. In the meantime, i’m going to go back to the KS page to drool a little more. 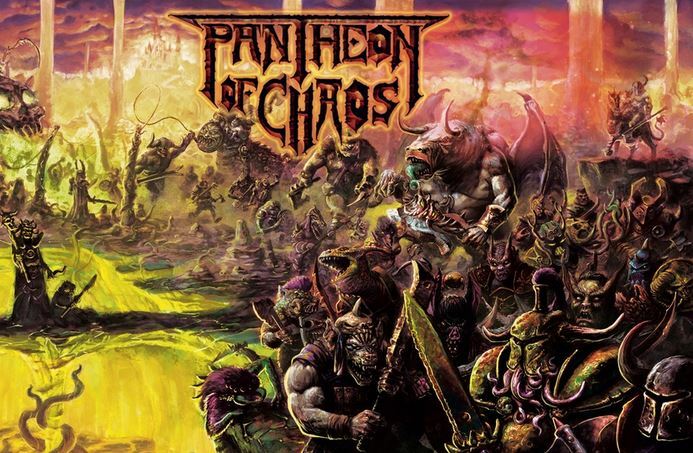 Author PaulPosted on June 15, 2017 Categories AnnouncementsTags indie miniature company, Kickstarter, Knightmare Miniatures, Lost and the Damned, Pantheon of Chaos, Realm Of Chaos, Slaves to DarknessLeave a comment on Pantheon of Chaos Part 2 Kickstarter is now up! A little while back I had mentioned about a pretty sweet little Kickstarter that I had pledged toward called The Pantheon of Chaos. Now anyone who has a long standing history with That Miniatures Company* knows about their out-of-print, fantastic, wish-I-hadn’t-sold-my –copies books under the banner: Realm of Chaos. These two mighty volumes were an in-depth look at the four chaos powers in the Warhammer/Warhammer 40,000 universes. Realm of Chaos: Slaves to Darkness focused on Khorne and Slannesh, while my personal favorite of the two, Realm of Chaos: The Lost and The Damned dealt specifically with Nurgle (yay!) and Slaanesh. Within these tomes were not only the army lists for fielding chaos in your fantasy armies, but also the renegades for the war-torn battlefields of the far future. They were beautifully illustrated with lots of background fluff and little stories dotted around to give you a glimpse into the insanity that is chaos. Additionally there were plenty of ‘Eavy Metal pages (remember those?) 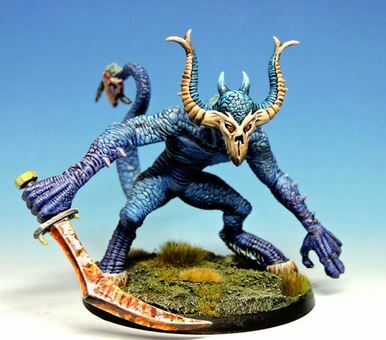 showing some spectacular (and long discontinued) painted miniatures and conversions. 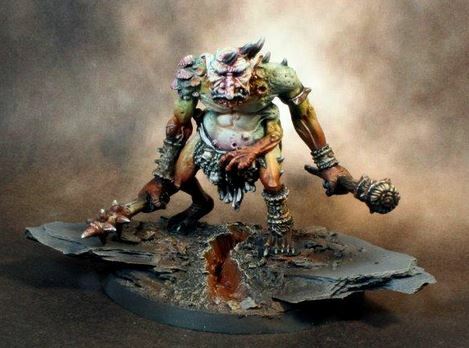 You could create a warband, generate special characters with all sorts of mutations which you would then go and create a converted miniature for, all sorts of good stuff! Now, for me, there is something very special about that era of my gaming history, not only because of the lore and general air that I felt at the time with the hobby, but because of how the miniatures captured my imagination and fed into the narrative. I would spend hours poring over those volumes soaking up all the information and reading and rereading the stories to the dulcet tones of the mighty Bolt Thrower. But, as with all things, you move on to other interests, and may sell off/give away all your stuff and that’s that. I did exactly that, and then lamented I did that when I got back into the hobby some time later. Waahhh! 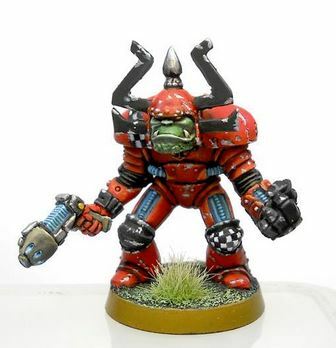 ( not Waaaaaagh!). Knightmare Miniatures have crafted a beautiful NOSTALGIAHAMMER in the form of their Pantheon of Chaos line, which is now available to the public, along with their ‘Greenskin Wars’ range (if you are an oldskool Orc/Gobbo player) and their Space Raiders (Space Orcs) range. You will see some very familiar characters in their ranges which I’m sure is in no small part due to Tony Ackland and Kev ‘Goblinmaster’ Adams being on their design/sculpting roster. All of the figures are just incredible and when I first saw them on Kickstarter, I felt that flame that I hadn’t felt since those early days of my misspent youth. Do yourselves a favor and pick up some goodies from these guys, you will not be disappointed. The prices are actually not bad either! I was amazed at my pledge awards when they dropped through my mailbox (seriously, everything was cast in metal, and the Demon of Malice is massive! ), and I cannot wait to get them painted. I believe a warband level skirmish ruleset may be forthcoming in support of the lines at some point soon. Support these guys and show them some love, they deserve it!